I’ve just come back from swimming at my local health club which has been undergoing a lengthy and no doubt costly refurbishment. In parts it looks great, and much improved. But with inadequate space for gym equipment, no promised juice bar/cafe and lack of seating in the changing rooms people seem a little disappointed and it all feels a bit of a compromise. It may well be that these issues are resolved but it does remind me of something that’s true for all of us. Whenever we settle and compromise because of our thoughts and perceptions about what’s possible we set ourselves up for disappointment. Worse still, when we’re stuck with the same old same old and keep recreating patterns from the past or more of what we don’t want it can lead to despair. But when we create what we love and what’s true, inspired by our hearts, intuition and imagination we can magically create more than we ever thought possible and experience real joy and delight. 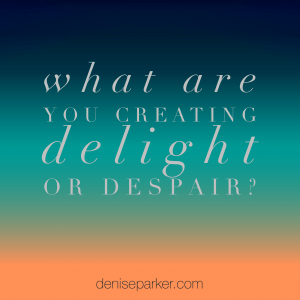 We have a choice and can learn to create more delight and less disappointment or despair.